The Country by country reporting – CBCR – is a considerable part of the Base Erosion and Profit Shifting (BEPS) program of OECD. Most of the EU countries have already implemented the new rule, while Hungary adopted it to the Hungarian legislation only in the last minute, during this summer. The related forms have been published as well in the meantime. 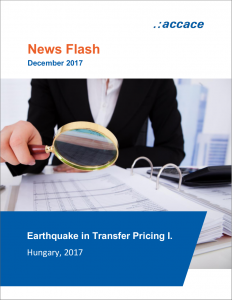 At the same time, the regulation of TP (Transfer Pricing) documentation has been replaced by a new legal act, entering into force in 2018. Our present Newsflash details the CBC reporting tasks in Hungary. Those group companies are subject to these new obligations that their consolidated annual turnover reaches EUR 750 000 000. The threshold shall be counted on the financial year preceding the current tax year. The first year in scope is 2016, so the financial indicators of FY2015 shall be checked. Which companies are obliged to fulfill the requirement? According to the general rule, the final mother company is obliged to prepare and submit the report. Consequently, it means that Hungarian company can be subject to this obligation only if the Hungarian entity is the final mother company of the group. the company group dedicate the reporting tasks directly to the Hungarian company. Which form is used for the reporting? Form no. 16CBC for the FY 2016. Is there any other obligation? he is not the final reporting entity. In this latter case, however, the name and country of residence of the reporting entity shall be registered with the tax office. Which form is used for this data supply? Form no. 17T201 for both FY 2016 and 2017. Which is the first FY in scope for the data supply? If the Hungarian mother company is the reporting entity the first year is 2016 (if FY = calendar year). If the Hungarian company is not the final mother company, but still the reporting enity (due to any reason) the first year is 2017. If the Hungarian entity is obliged for only data supply abou the riporting entity, the first year in sope is 2016. What deadlines shall be kept? If the Hungarian entity is the final reporting mother company the deadline is 12 months after the given FY. So regarding FY 2016 the reporting deadline is 31st December 2017. If the Hungarian entity is not a reporting entity, the deadline for data supply is the last day of the given FY. For FY 2017 the deadline is 31st December 2017. As the first year in scope is 2016, the deadline was extended until the end of 2017, so 31st December 2017 is the deadline for the data supply re FY 2016 as well. What deadlines shall be kept? So, what shall be kept in mind until 31st December 2017? Let’s talk about how we can work together in Hungary!